The Nigerian Navy in Port Harcourt has intercepted four barges laden with 1.75 million litres of suspected adulterated diesel believed to worth over N450 million. Capt. Samuel Garba, Executive Officer, Nigerian Navy Ship, Pathfinder, made the disclosure on Wednesday while parading the barges and two suspects in Onne, Rivers. He said the two suspected smugglers were arrested on account of their alleged role in the illegal shipment of the petroleum product to undisclosed locations in the state. “On October 25, troops on routine patrols around Owoghono Creek in Onne, seized four large metal barges and arrested two suspects over illegal bunkering activities. 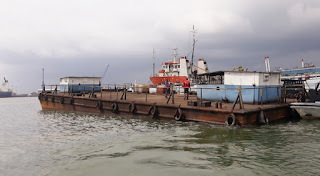 “The barges, MV Selah 1; MV Akemijoe 2006; MV Abiliba and MV Yoma were laden with estimated 800,000, 350,000, 400,000 and 200,000 litres of suspected illegally refined diesel respectively. “The suspects and barges were immediately detained on account of their inability to present relevant documents and permit authorizing the shipment of the petroleum product,’’ Garba said. He said the suspects had been in naval detention to enable interrogators to carry out a preliminary investigation on the matter. “After the conclusion of our investigation, the suspects, barges and petroleum product will be handed over to the Economic and Financial Crimes Commission for further investigation. “The Nigerian Navy will sustain its zero-tolerance approach against crude oil theft, illegal bunkering activities and other maritime-related criminality, ‘’ Garba said.